Why would anyone give up 50 years of their life to work without getting paid? That was the question I posed to various women gathered from the over 55 chapters of the Philoptochos society at their Agape luncheon held March 10th 2013 at Terrace on the Park. The luncheon, presented and hosted by the women from the Direct Archdiocese and District (mostly from from the tri-state NYC area, including Washington, D.C) honored a total of 200 women, 74 of whom were able to receive their awards in person. In the spirit of the Philoptochos, the proceeds from the event would also go towards benefitting the victims of Hurricane Sandy. If you do the math, this number adds up to over 10,000 years of service to the cause of philanthropy in the name of Orthodoxy! In its entirety, Philoptochos is a national organization encompassing 290 Chapters with 27,000 members. On this glorious spring day the park ballroom was teeming with over 600 participants from all walks and stages of life–a testament to the organizational power of a relatively small organization that began with a handful of women meeting once a month in church basements or rented rooms around the country, all in the name of doing good in Christ’s name. So, what is the motivation to be a part of Philoptochos? The response was as dynamic and diverse as the women themselves. 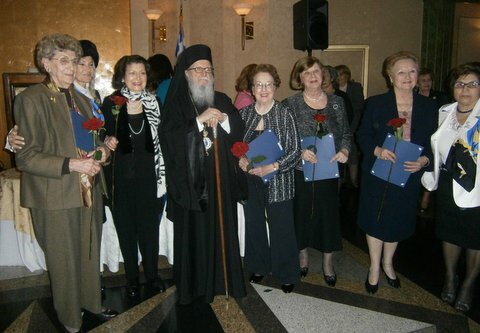 Julie Cachulis, one of the oldest members who served as President of St. Anna’s Philoptochos from the Cathedral of St. Paul, Hempstead, was recently also recognized for 58 years of service from her chapter. She brings out another reason: it can be a lot of fun. She cited having fashion shows at B Altman’s and brunches at Saks Fifth Avenue as an excellent way to fundraise and have a good time. The society serves as a platform for fostering bonds among women. The president of Holy Trinity-St. Nicholas Church of Staten Island, Penny Karides, noted one of the most important missions right now is its ongoing support for the victims of Hurricane Sandy. She has made all her three daughters members to carry on the tradition of philanthropy across generations. 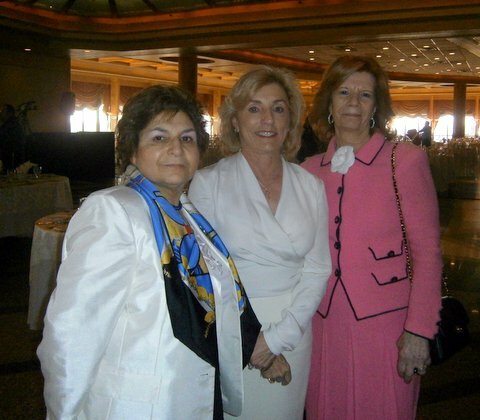 She also cites the opportunities for bonding that exist in the organization by pointing out the tri-chapter luncheon that spans the boroughs of Brooklyn and Staten Island. Another woman with 30 years of service, Lucy Bounas, the first Vice President of St. Constantine and Helen in Brooklyn, who incidentally is of Hispanic descent, remarked that the organization allows for a democratic female voice in church affairs. Each chapter elects its own agenda and what is “close to their hearts” and the issues and causes it will pursue throughout the year. Therefore, Philoptochos is one way for women to get involved in the church as active members. This reason, cited by Nia Soumakis, is of paramount importance as she notes that in the male-dominated church hierarchy women are underrepresented and ignored. President Skaedes, an attractive blonde with a vivacious voice, is proof positive that the stereotype of a Philoptochos woman as an old biddy yiayia with so much time on her hands she can put together flea market tables is wrong. As a matter of fact, the organization has experienced an upsurge in enrollment from younger women. To draw younger members, the organization is alternating meeting schedule to accommodate busy professional homemakers and they are encouraging part time membership and flexibility in helping out with events from their home. The Philoptochos’ history is intimately tied to the history of the omogenia from its beginnings. Starting from small, informally organized clubs of women that welcomed new émigrés in the urban centers of the US, the first Philoptochos was formed in 1909 in Chicago using the buildings of the famous Hull House thanks to the generosity of Jane Addams, a fervent philhellene herself. It was not until June 29, 1920 that the first officially recorded encyclicals of the Church acknowledged the benevolence of Greek women by mentioning their contribution to the relief of the Greeks of Asia Minor. After the Greek Orthodox Archdiocese of North and South America was founded and received its incorporation from the State of New York, the Holy Trinity Philoptochos Society in New York City was itself granted a charter. Under the administrative and legal authority of Archbishop Athenagoras who was instrumental in establishing the by-laws and a constitution, the society blossomed into many chapters and expanded the breadth of its responsibilities. Not only was the society responsible for baking the prosphora, sewing the altar cloth, and providing for the poor as it always had, but now it was charged with educating the youth in after-school and Sunday school programs. In fact the Philoptochos was integral to the founding and continued support of Holy Cross Theological School. In 1944, it was entrusted with the former Jacob Ruppert estate in Garrison, NY, a 250-acre property which was with time converted into the present St. Basil’s Academy, an orphanage and children’s home. The orphanage through the philanthropy of the Philoptochos has managed to raise many needy children into successful adults, one of whom was Senator Olympia Snowe, a former Senator of Massachusettes. Moving forward the organization garnered a major triumph this past November when enough funds were collected to purchase its national headquarters on East 37th Street in the Murray Hill section of NYC. After 80 years without a real meeting space, the building will provide a hub for much of the Philoptochos’ activities. Besides providing office space for the National Board, it will expand training and development programs, (wo)man a few hotlines for domestic violence, and spearhead new efforts to draw in younger members into the organization. Maria Skiadas, the Direct Diocese President, expressed the goal to galvanize an effort to help seniors once the headquarters are established. Like the National President, she believes it is vital to the organization to engage younger women with so many smart ideas, especially since there has been an upsurge in younger membership. “We need the young innovative women with smart ideas to keep the continuity of the organization,” she says. However, she points out it is because of these yiayias that many of the younger members have been recruited to continue the devotion to the Philoptochos. As she expressed, the Philoptochos has a place for all women, especially three kinds of women: “the elderly woman with the experience, the wealthy woman to write the check and then the army.” And an army of strong, dynamic women to get the job done is a formidable force.